The law relating to recourse is always changing, but the present period is notable for the number of countries whose law has recently undergone, is now undergoing, or is about to undergo extensive reform. This makes the comparison of differing systems particularly difficult. 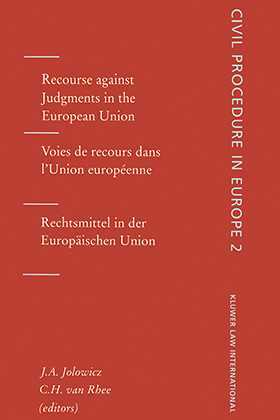 Recourse against Judgments in the European Union is the second volume in the series 'Civil Procedure in Europe'. This volume gives a comparative overview of the systems of recourse against civil judgments actually in operation in 14 countries of the European Union. The reports were written against the background of a document originally circulated in July 1995, but each of them remains the original work of its individual author. The contributions are written by national expects distinguished in the field of civil procedural law. The main reports are written in English, French, German and in one case Spanish, and are followed by summaries in the remaining languages. Extensive bibliographies have been included, to enable the reader to find material for further study. The national reports systematically address the following: a description of the right of appeal in each country; the nature and scope of the appeal against First and Second Instance Judgments; enforceability of Judgment subject to recourse; default Judgments. Austria, Belgium, Denmark, England and Wales, Finland, France, Germany, Greece, Ireland, Italy, The Netherlands, Portugal, Spain and Sweden.